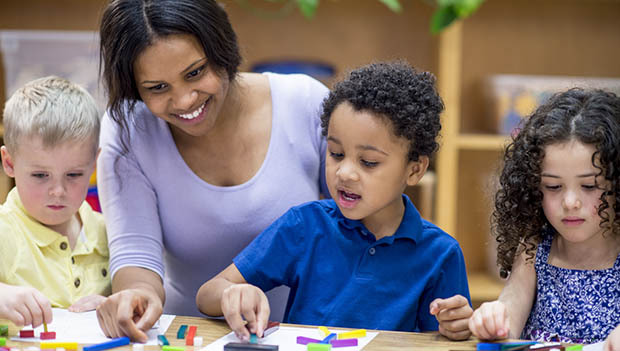 Whether your child has been at home with you, in daycare, with a nanny or in pre-K, heading to kindergarten is a big deal, and a very important step toward a life full of learning. Setting a fun, stress-free foundation of school is a goal all parents should have for their kids. Here are a few ways to help make it happen in time for fall. The best way to get your kid from "not sure about this kindergarten thing" to "ready to do this" is to hear it from a big kid they look up to. Arrange a play date with a kid who's been there and prep their mom in advance that there might be some kindergarten talk. Odds are the older kid will be excited to bring a newbie into the fold. Most schools do a kindergarten visit night, but they're crowded, loud and can be overwhelming for 5-year-old kids in a new place. See if you can visit the school on a normal day and peek into the classroom to see kids that look like your kid just doing their thing. Your child will see there's nothing to worry about. If uniforms are a thing at your kid's school, have the conversation early and often. Figure out how your child is feeling about uniforms and address their concerns head-on. Focus on the positives: quicker morning routine, fewer decisions to make, easier to get dressed every day. Then remind them that on weekends, they can wear whatever they want. Last year I took my kids to my old elementary school to vote with their grandparents. We visited my old kindergarten classroom, and they got to see what it looked like back in their mom's day. They appreciated the reminder that their mom was once a kid like them, and I loved the throwback too. If your kids are anxious about school, let them know it's totally normal to feel that way and that they can talk to you about it any time. New friends, teachers, environments and routines can be a lot, so be sure to give your little one a bit of extra grace during the transition. Back-to-school time can be a particularly good opportunity to pick out a new lunchbox or backpack, but it's especially useful when lots of changes are afoot. Something extra special or extra sparkly to focus on can really make a difference. When you talk about kindergarten, keep a super positive spin on everything. Remind them often that kindergarten is for big kids, and that you're way proud of them for being big enough to get to the next step.